Manufacturing thousands of locks every day takes dependable people and precise processes – not to mention reliable equipment. 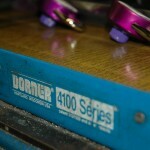 So when Master Lock needs conveyor systems to move shackles, plugs and tumblers through the manufacturing process, Dorner is the perfect fit. Founded in 1921, Master Lock is the world’s largest manufacturer of padlocks and related security products providing innovative security solutions for home, automotive, campus, power sports, bike and storage security needs for consumers and contractors alike. Oak Creek, Wis.,-based Master Lock designs and builds a variety of combination and key locks for both indoor and outdoor applications. But manufacturing all those different styles of locks is no easy feat. Master Lock has about 20 Dorner conveyors operating in its Milwaukee facility, with most performing in-feed and out-feed functions. Although the various parts of a lock are lightweight, they are steel components, and the conveyors need to be robust to handle the parts as they travel throughout the manufacturing process. Through the years the company has used a mix of conveyors, including early model 2100 and 4100 Series to more modern MPB and 3200 Series. Even the Slug-o-Matic, a conveyor series Dorner sold during the early 1970s, is still operating at Master Lock. Not surprisingly, the Slug-o-Matic was originally designed to remove small slugs from tight places inside stamping presses. Soon thereafter, other customers beyond metal stamping discovered the conveyor?s low profile could be used in other tight-fitting places. If a museum of sorts for conveyors existed, the Slug-o-Matic would certainly be on display. But the fact that the eight-foot long, two-inch wide blue conveyor is still being used decades later to move tumblers is a testament to its durability and functionality. The 3200 Series is one of the newer conveyor series in action at Master Lock. It’s being used to move keys to vibratory feeder bowls for cutting. The application involves an eight-foot long, six-inch wide cleated conveyor standing almost upright from the floor. A bin holding thousands of uncut brass keys automatically deposits a few keys at timed intervals on the conveyor. Keys travel up to a vibratory feeder bowl, where they are separated and positioned for cutting. A clear plastic shield covers the length of the conveyor to prevent dirt and debris from coming in contact with the keys. The 3200 Series is manufactured with fully sealed bearings for low maintenance, strong, anodized aluminum alloy frame, and a rack-and-pinion design for fast, single-point belt tensioning. It comes with V-guide tracking, which eliminates any lateral movement of the conveyor?s belt; widths between 3.75 and 48 inches, and lengths from four to 99 feet. In the finishing room, an eight-foot long, 12-inch wide 2200 Series is used to move freshly painted padlock dials to be stacked and dried. 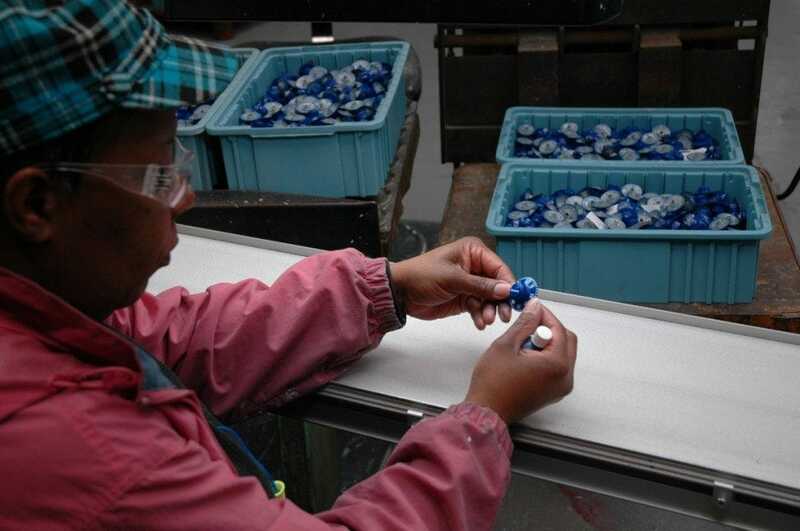 An employee sits alongside the conveyor and visually inspects each dial, and applies any touch-up paint as required. Since people are working close to the conveyors, safety of equipment is a must. That’s why Master Lock examines the safety features of all equipment as a factor for consideration prior to purchase. Dorner’s 2200 Series is available in flat belt end drive, cleated belt end drive, center drive and gravity roller models. It has a low profile as small as 1.25 inches, making it fit into tight places, such as under a press, with ease. Other features include a V-guide bed plate and belt for positive belt tracking, load capacity up to 120 pounds, widths up to 2 feet and lengths up to 18 feet. 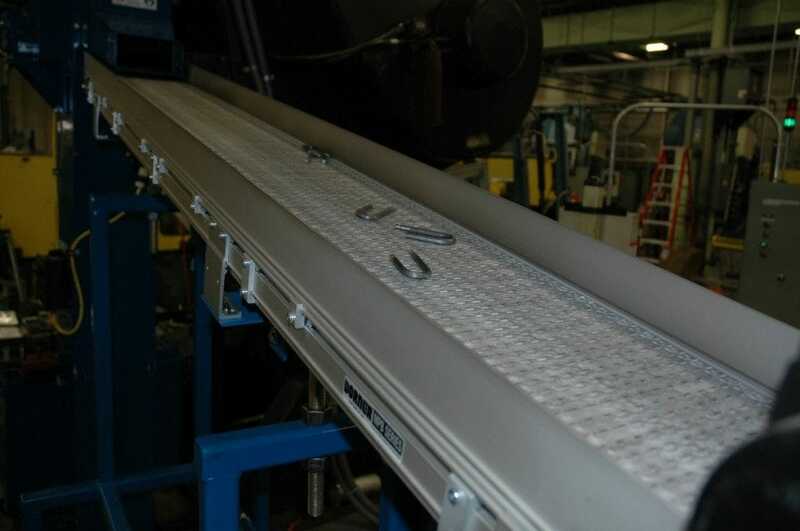 Another conveyor platform, Dorner’s Modular Plastic Belt (MPB), performs out-feed functions by taking U-shaped shackles that lock into place, to additional processing. The 10-foot long conveyor is positioned about six feet in the air and moves the shackles about seven feet to be heat treated. Supported from a conveyor stand on the floor, the conveyor is situated in a manner that keeps employees safe and prevents them from walking through. Its modular plastic belt makes the MPB virtually cut resistant, and also durable for more industrial and harsh environments. From a durability standpoint, Lenhof said aside from belt changes and periodic bearing replacements, the conveyors have been virtually maintenance free. Master Lock runs three shifts, six to seven days a week, and as such the conveyors operate around the clock. Lenhof does have a bench stock of common replacement parts to minimize conveyor downtime when maintenance is required.